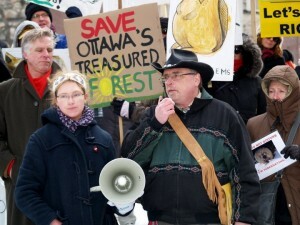 On the last day of the first month of the UN-declared Year of the Forests, clear-cutting began on the Beaver Pond Forest, a section of the sacred and ecologically-unique South March Highlands in the west end of Ottawa, Canada’s capital. Trees that had lived peacefully for over 100 years were found dismembered, animals whose winter living patterns had been disrupted were found dead, and the living legacy of a potentially 10,000-year-old cultural site was being destroyed. There were final acts of resistance from people who were part of the broad-based opposition to the destruction: at sunrise the day after cutting began, two Algonquin warriors chained themselves to trees that were to be cut, and at noon the same day six people staged a sit-in at the mayor’s office. There were rallies outside city hall, and later outside the provincial Liberals’ caucus meeting at the Westin Hotel, and the next week 21 activists formed a circle around a tree cutting machine to prevent its operation. While the environmental considerations of the candidate ANSI (Area of Natural and Scientific Interest) area are truly compelling, the archaeology of the forest became the focal point, as activists pointed to two reviews of the developer’s original archaeological assessment that pointed to its dismissal of pre-European contact archaeological potential as ‘fatally flawed’ and urged further more careful assessment. Significant archaeological finds in the area back up that conclusion for the highlands that formed an island while much of Ottawa and area were under the waters of the Champlain Sea. Both the municipal and provincial governments had means to stop the cutting to order further studies, but both stated it was up to the other, and neither took any action. His words have brought together the Alqonquin community as part of the coalition to protect the forest: five Algonquin First Nations wrote letters to government declaring their need to be involved in the consultation process for this development on their unceded territory, as guaranteed in the constitution and the United Nations Declaration of the Rights of Indigenous Peoples, but were ignored. 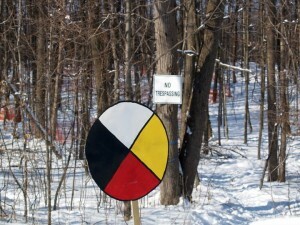 The “Algonquins of Ontario”, in a land claims process with the provincial and federal governments but not representing all Algonquins in Ontario, were ‘consulted’ and KNL Developments delayed cutting to allow them to review the original archaeological assessment. But when their review suggested the need for a further assessment after the snow melted, KNL started cutting the trees anyways. Aboriginal participation in the efforts to save the land brought a spiritual dimension to the forefront. Algonquin elder Albert Dumont led full moon ceremonies at the forest, and Daniel “Amikwabe” Bernard led a sacred fire ceremony at Beaver Pond in mid-January, returning a few days later to re-light the sacred fire that would continuously for 11 days, ending with a multi-faith Pray For The Land ceremony that was a continuation of two similar gatherings held during the process to stop uranium exploration near Robertsville in Eastern Ontario in recent years. After participating in the circle that blocked the tree cutting machine on February 8, Julie Comber wrote a song to encompass the experience of fighting for the forest (available online at candle4kindness.wordpress.com). The first time it was sung, after the closing ceremonies of the four-day sacred fire that Bernard held at Queen’s Park from February 9-13, two red-tailed hawks appeared in the sky.